Komori Corporation (Sumida-ku, Tokyo; President, Representative Director and COO: Satoshi Mochida) has added a new eight-color Lithrone G37P perfector to the lineup of 37-inch sheetfed presses.The following is an outline. Komori has added a new eight-color Lithrone G37P perfector to the lineup of 37-inch sheetfed presses. The Lithrone G37 was recently reborn as a new model combining functionality and design. 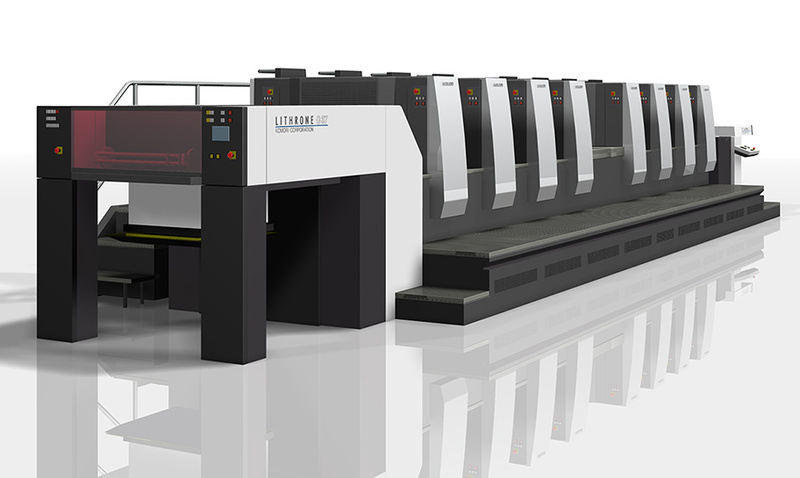 An eight-color Lithrone G37P perfector capable of one-pass double-sided printing has been added to the lineup. With its compact body size, the Lithrone G37P expands the installation possibilities for users who had installation space issues. Moreover, the press can be equipped with a wide range of options, including not only the H-UV/H-UV L (LED) high sensitivity UV curing system that has become indispensable in recent years but also the PQA-S Print Quality Assessment System and the PDC-SX Spectral Print Density Control with automatic registration function. Capable of high-level laborsaving and high productivity, the press is the new standard machine. The new Lithrone G37P perfecting mechanism has a rotating structure at the gripper that is gripping the tail edge of the sheet, and there are no gripper changes while perfecting, enabling stable front/back register. In addition, smearing and scratches caused by the rim unique to the perfecting cylinder are eliminated since the surface of the perfecting cylinder is flat, and high print quality can be achieved. The structure is simple, significantly improving durability and ease of maintenance. The installation of several Lithrone G37P presses around the world has already been determined, and it will be debuted at the Pre-IGAS event scheduled to be held at the Tsukuba Plant on June 14-15. It will also be exhibited and demonstrated at IGAS 2018 beginning on July 26. Greatly reducing the initial cost and running cost (materials such as plates) compared to a conventional 40-inch press, the Lithrone G37 series presses are certain to be strategic machines that will be key to generating customer profit..
*Presses with 2 to 6 colors are scheduled to be added in order to the lineup.